As the Tacoma teachers enter Day 6 of their strike, the school district says it is considering its options to get educators back to work. UPDATE: Tacoma teachers reached a tentative agreement Thursday night. School is scheduled to start Monday, pending a vote from the Tacoma Education Association. Tacoma teachers may be taken to court if they don't end their strike. Officials at Tacoma Public Schools are considering their options to get educators off the picket line and back in the classroom. District spokesperson Dan Voelpel confirmed Thursday morning they are considering seeking an injunction to declare the strike illegal. It's unclear how effective suing the teachers union would actually be, however. Voelpel would not go into specifics on the other options on the table to get teachers back to work. On Wednesday, a Thurston County Superior Court judge ruled there is evidence to support that the strike is causing harm and ordered teachers to return to work. Hours later, Tumwater Education Association President Tim Voie said teachers would continue to strike. The Tumwater School District could return to court to seek contempt charges or fines. Meanwhile, Tacoma teachers are on Day 6 of their strike. The Tacoma School District remains at an impasse with teachers. The school board introduced a new contract offer Wednesday while hundreds of teachers picketed outside the administration building, saying the offer wasn't enough. Then the Tacoma Education Association (TEA) said the district went too far with a voicemail sent to teachers. The message said, "Staff members who choose to report to work Thursday and future work days before school officially starts will receive extra pay for extra work." TEA president Angel Morton criticized the voicemail, saying, "I'm thoroughly disgusted by the Tacoma School District and their strike-breaking efforts. This is really low, to call people and act like school is back in session. The strike has not been resolved." KING 5 reached out to the district about the voicemail and will update this article as we hear back. 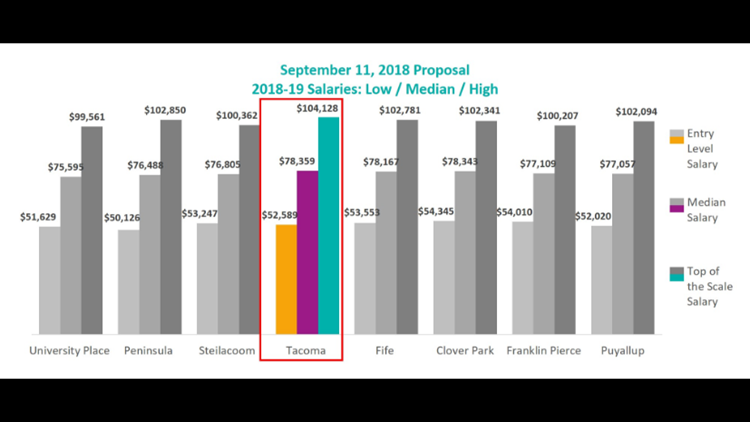 The Tacoma School District says Wednesday's latest offer includes a 12.45 percent salary increase, and that it would bring median and high salaries above those of neighboring school districts: University Place, Peninsula, Steilacoom, Fife, Clover Park, Franklin Pierce, and Puyallup. The district also says their new proposal devotes $18.7 million to increase teacher salaries for this current 2018-2019 school year. "4.4% of the 12% is "recycled" money. Meaning, they are taking the optional days that they already pay you for, and are moving it on to the base salary schedule. The district's latest offer would require you to work another district-directed day. More work for more pay is NOT a "raise." Their last proposal removes $150,000 from professional development reimbursement funds and these dollars are also rolled it into the base salary, and again calling it a "raise." This proposal puts us below the average of our neighbors and won't keep us competitive. So, when all is said and done, the 12% "raise," actually only translates to 6.95% of new money." Gov. Jay Inslee is paying close attention to the teacher strike. Tara Lee, Inslee’s deputy director of communications, said the governor spoke with both sides this week over the phone. Inslee has urged the district and teachers union to come together and negotiate, according to Lee. “The governor’s office continues to monitor the situation and hopes that teachers and kids get back in the classroom as soon as possible,” she said in a statement to KING 5. Roughly 30,000 students are enrolled in the Tacoma School District. During the strike, all school activities and events are also canceled. High school athletics will continue as planned. The district is serving free breakfast and lunch to all students at these 12 locations. Check here for childcare options in Tacoma. This year has seen the most teacher strikes in Washington state since 1983. The reason stems from the McCleary Decision, which set aside $2 billion for teacher salaries in the current budget. EXPLAINER: What's the McCleary Decision?